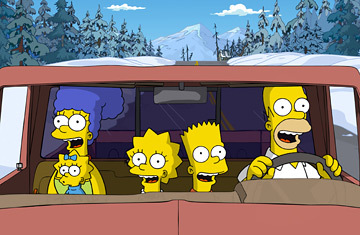 The Simpsons on a family outing in The Simpsons Movie. Timehost: Who are the key cultural figures of our time? That's the question we're going to answer tonight  or at least we'll talk a lot about it. What do Bart Simpson and T.S. Eliot have in common? TIME magazine has picked them both as two of the most important cultural figures of our century. What do you think about that? Let us know! Bruce Handy: Both Bart and Eliot are partial to nonsense words like Cowabunga. More seriously, I think those two choices are pretty indicative of the range of 20th century art, the span from high to low as the century progresses. Timehost: Hello everyone. Bruce Handy, senior writer for TIME magazine is just joining us. Bart's right up there with Picasso and James Joyce. And Frank Sinatra. Our guest tonight, TIME senior writer Bruce Handy wrote about Sinatra for the issue. And he joins us now to talk about it all. Thanks for being here. Timehost: Let's start with a question from online... one of the ones people have been asking all week... JLW19 asks: How does Bart Simpson even fall into this category of one of the most important cultural figures? Bruce Handy: Um.... Well, for one thing you have to look at this as a predictive choice. Bart hasn't been around long enough for his real impact to be assessed. But we're betting it will be felt well into the 21st century. What Bart, or really the Simpsons, have done is merge social satire with popular animation in a way that hasn't really been done before. And you can't talk about 20th century art without taking into account pop culture. It's almost what defines the century. And when you look at animation  which is arguably the purest form of cinema  I truly believe the Simpsons is both first rate and of lasting quality. I think when people a hundred years from now want to get a sense of what the 90s were like they could do a lot worse than watch The Simpsons. It will still be being viewed and enjoyed when a lot of contemporary, serious literature is forgotten. Does anyone think, I don't know, David Foster Wallace is a better satirist than Matt Groening? Blah blah blah. Have I answered the question? Timehost: We'll see if people agree about Bart. JLW19 asks: Who selected these figures? Bruce Handy: Basically Time editors and writers in consultation with CBS and outside experts and artists like Martin Scorcese. On the subject of selection, it was a very disputative process. Obviously, when you're talking about the arts, all is subjectivity. Frankly, we were hoping to generate argument and discussion, so maybe this chat is proof we've succeeded. Which isn't to say we made deliberately stupid or outrageous choices. CoventryChapel asks: How significant was Bob Dylan to the political thought of America? Bruce Handy: I don't know if Dylan was, or ever presented himself as, a serious political thinker. I think what's significant about him is that he brought political subjects and  really more to the point  political anger into popular music. This was something new. I think he also crystallized for people what had been a lot of inchoate emotion and anger at the system. But I don't think he was into agitprop. That's why we still listen to him. Det_David_Mills__NYPD asks: is Jim Morrison on the list? Jim Morrison should have been at least on the list. Bruce Handy: I love writing about Sinatra because I love Sinatra, and because he's so compelling in so many different ways  as musician, as public figure, etc. But it was hard trying to write a 1000 word tribute explaining why he was great two weeks after his death when every publication in America had already written 1000 word tributes explaining why he was great. I ended up being contrarian and looking at some of his worst recordings and trying to see what was good, or at least quintessential, in them. You haven't lived if you've never listened to the "Future" disc of the Trilogy album. It's a 40 minute suite written especially for Sinatra where he sings about space travel and getting old and all kinds of ridiculous things. It even rhymes "Hades" with "ladies." (don't ask me the context). For sheer weirdness, it blows away anything Jim Morrison ever did. And Sinatra was pushing 70 at the time. Now that's a committed artist! Timehost: Here's a follow-up... Mister_Wonderful asks: So you didn't have him on the list before he died....oh...really....so you didn't consider him "great" until then? Bruce Handy: No, Sinatra was on the list long before he died. He was one of the more consensus choices. I just didn't get around to writing my Time 100 piece on him until last week.